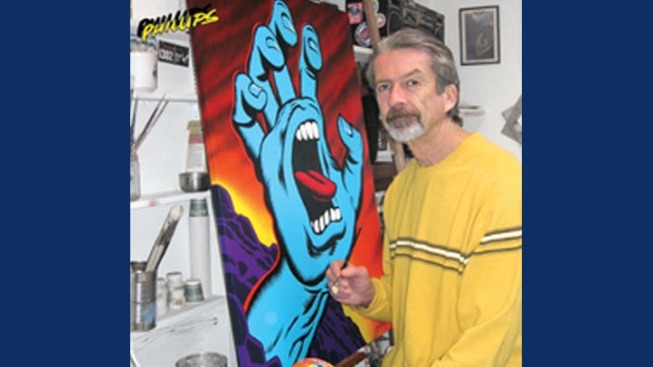 Jim Phillips with his iconic Screaming Hand. The Screaming Hand will celebrate its 30th anniversary at the Santa Cruz Museum of Art and History this week. An electric blue hand seemingly severed below the wrist reaches out, fingers bent, with a grimacing mouth—complete with a bright red tongue and set of teeth — emerging from its palm. If you’re a follower of the eclectic art scene, part of skate culture or just a resident of Santa Cruz, you’ll know exactly what this is: It’s the Screaming Hand. The cartoon image has become a pillar of the art scene, especially in Santa Cruz, since its conception by artist Jim Phillips in 1985. It’s been pasted on skateboards, t-shirts and pillows, among hundreds of other memorabilia commemorating its legacy. Now, the Screaming Hand will celebrate its 30th anniversary at the Santa Cruz Museum of Art and History. The exhibition will feature the original image in all its glory, alongside hundreds of variations of the piece re-imagined in different contexts, including a Screaming Hand X-Ray with a real light table and hyper-realistic photo of a human hand made to look like it’s screaming. The Screaming Hand exhibition will open Friday and is expected to attract 2,000 to 3,000 visitors on the first day, according to museum spokeswoman Elise Granata. Alongside original sketches of the hand, there will be over 100 international artists represented in the show, including Phillips’ son, Jimbo. The display not only shows the success of the historic art piece, but celebrates it as an icon of skate and youth culture, as well as the town that it came from. IF YOU'RE INTERESTED: Jim Phillips will be discussing his artwork on Friday at 5:30 p.m. The event is free. The museum is at 705 Front Street in Santa Cruz.